QU HaiZhou, ZHOU ZiKun, ZHANG YunFeng, CHEN Wei, ZHANG ZhengHong, LUO XinSheng, MA Chao, TAN Fei, ZHU YuHuan. Research Progress of Porosity in Microbial Carbonates[J]. ACTA SEDIMENTOLOGICA SINCA, 2018, 36(4): 651-663. Abstract: Microbial carbonates are not only important sedimentary records for paleo environments, paleoclimate and geological events, but also significant hydrocarbon reservoirs. Physiological characteristics of diverse microbial communities in part control the formation and preservation of primary pores, microbial depositional fabrics in various scales affect the diameter and distribution of pores. Combination patterns of microbial carbonates and associated facies have a great impact on usefulness and scale of pores. Different sedimentary processes and depositional environments of microbial carbonates affect sequences and degrees of cementation and dissolution during meteoric diagenesis, resulting in heterogeneity of pores. Microbe-related diageneses such as dolomitization, cementation, and karstification may form primary pores, protect residual pores and form secondary pores during various stages. Pore diameters of microbial carbonates are in range from nanometer-submicron level to centimeter and even meter level, which may correspond to multi-scale sedimentary structures to some extent. Therefore, it's necessary to analyze and characterize samples in various scales. In addition, the combination of geology and geophysics should be enhanced, being an important way to facilitate research of hydrocarbon reservoirs of microbial carbonates also benefit for the exploration and exploitation of oil and gas resources. 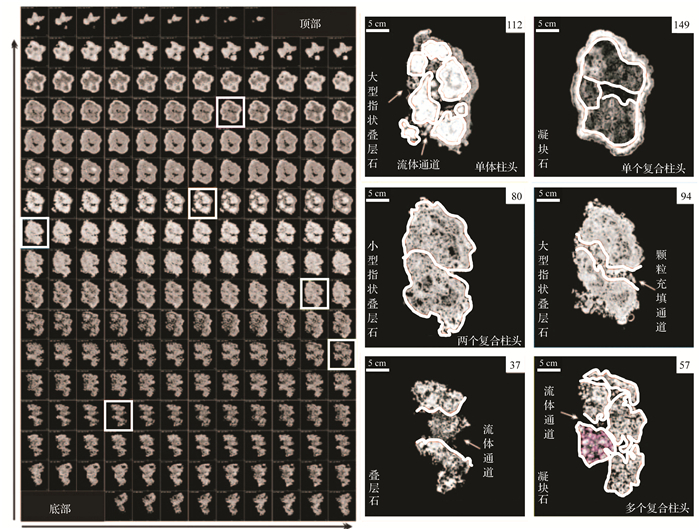 Riding R. Microbial carbonates:the geological record of calcified bacterial-algal mats and biofilms[J]. Sedimentology, 2000, 47(S1): 179-214. Riding R. Microbialites, stromatolites, and thrombolites[M]//Reitner J, Thiel V. Encyclopedia of Geobiology. Netherlands: Springer, 2011: 635-654. Gerdes G. What are microbial mats? [M]//Seckbach J, Oren A. Microbial Mats: Modern and Ancient Microorganisms in Stratified Systems. Dordrecht: Springer-Verlag, 2010: 3-25. Bosence D W J, Gibbons K A, Le Heron D P, et al. Microbial carbonates in space and time:implications for global exploration and production[M]. London: Geological Society, 2015. Riding R. Microbial carbonate abundance compared with fluctuations in metazoan diversity over geological time[J]. Sedimentary Geology, 2006, 185(3/4): 222-238. Tunis G, Pugliese N, Jurkovšek B, et al. Microbialites as markers of biotic and abiotic events in the karst district, Slovenia and Italy[M]//Tewari V, Seckbach J. STROMATOLITES: Interaction of Microbes with Sediments. Dordrecht: Springer, 2011: 251-272. Ahr W M. Geology of carbonate reservoirs:the identification, description, and characterization of hydrocarbon reservoirs in carbonate rocks[M]. New Jersey: Wiley, 2008: 200-254. Archie G E. Classification of carbonate reservoir rocks and petrophysical considerations[J]. AAPG Bulletin, 1952, 36(2): 278-298. Choquette P W, Pray L C. Geologic nomenclature and classification of porosity in sedimentary carbonates[J]. AAPG Bulletin, 1970, 54(2): 207-250. Lucia F J. Petrophysical parameters estimated from visual descriptions of carbonate rocks:a field classification of carbonate pore space[J]. Journal of Petroleum Technology, 1983, 35(3): 629-637. Lucia F J. Rock-fabric/Petrophysical classification of carbonate pore space for reservoir characterization[J]. AAPG Bulletin, 1995, 79(9): 1275-1300. Lucia F J. Carbonate reservoir characterization[M]. Berlin Heidelberg: Springer, 1999. Riding R. The nature of stromatolites: 3, 500 million years of history and a century of research[M]//Reitner J, Quéric N V, Arp G. Advances in Stromatolite Geobiology. Berlin Heidelberg: Springer, 2011: 29-74. Corbett P W M, Hayashi F Y, Alves M S, et al. Microbial carbonates: a sampling and measurement challenge for petrophysics addressed by capturing the bioarchitectural components[M]//Bosence D, Gibbons K, le Heron D, et al. Microbial Carbonates in Space and Time: Implications for Global Exploration and Production. London: Geological Society of London, 2015. Brock T D, Madigan M T, Martinko J M, et al. Biology of microorganisms[M]. 7th ed. New Jersey: Prentice Hall, 1994. Tedesco W A, Major R P. Influence of primary ooid mineralogy on porosity evolution in limestone and dolomite reservoirs:an example from the Eastern Gulf of Mexico Basin[J]. Pesquisa Agropecuaria Brasileira, 2012, 34(3): 493-498. Sánchez-Román M, Vasconcelos C, Warthmann R, et al. Microbial dolomite precipitation under aerobic conditions: results from Brejo do Espinho Lagoon (Brazil) and culture experiments[M]//Swart P K, Eberli G P, Mckenzie J A. Perspectives in Carbonate Geology: A Tribute to the Career of Robert Nathan Ginsburg. London: John Wiley & Sons Ltd, 2009: 167-178. Sánchez-Román M, Mckenzie J A, De Luca Rebello Wagener A, et al. Presence of sulfate does not inhibit low-temperature dolomite precipitation[J]. Earth and Planetary Science Letters, 2009, 285(1/2): 131-139. Postgate J R. The sulphate-reducing bacteria[M]. Cambridge: Cambridge University Press, 1979: 1-155. Berner R A. Early diagenesis:a theoretical approach[M]. Princeton: Princeton University Press, 1980: 1-245. Durand B. Kerogen:insoluble organic matter from sedimentary rocks[M]. Paris: Editions Technip, 1980: 1-560. Moore T S, Murray R W, Kurtz A C, et al. Anaerobic methane oxidation and the formation of dolomite[J]. Earth and Planetary Science Letters, 2004, 229(1/2): 141-154. Flügel E. Microfacies of carbonate rocks:analysis, interpretation and application[M]. New York: Springer, 2004: 267-334. Krumbein W E, Cohen Y, Shilo M. Solar Lake (Sinai). 4. Stromatolitic cyanobacterial mats[J]. Limnology and Oceanography, 1977, 22(4): 635-656. Viles H A, Gorbushina A A. Soiling and microbial colonisation on urban roadside limestone:A three year study in Oxford, England[J]. Building and Environment, 2003, 38(9/10): 1217-1224. Hill C A. H2S-related porosity and sulfuric acid oil-field karst[M]//Budd D A, Saller A H, Harris P M. M 63: Unconformities and Porosity in Carbonate Strata. Washington DC: AAPG, 1995: 301-306. Reolid M. Taphonomic features of Lenticulina as a tool for paleoenvironmental interpretation of midshelf deposits of the Upper Jurassic (Prebetic Zone, Southern Spain)[J]. Palaios, 2014, 23(7/8): 482-494. Blum P. Physical properties handbook: a guide to the shipboard measurement of physical properties of deep-sea cores[C]. Texas: Ocean Drilling Program, 1997. Jarrard R D, Kerneklian M J. Data report: physical properties of the upper oceanic crust of ODP Site 1256: multisensor track and moisture and density measurements[C]//Teagled A H, Wilson D S, Acton G D, et al. Proceedings of the Ocean Drilling Program Scientific Results, Volume 206. College Station TX: Ocean Drilling Program, 2007: 1-11.